Urban climatology has always been an important and traditional aspect in Stuttgart with roots that dated back 75 years in the year 2013. It was in the year 1938 that the city council decided to employ a meteorologist whose job was to make analyses on the climatic conditions in Stuttgart and to reveal the connection between climate and urban development. Even then, the aspect of climatic hygiene in urban development was recognised as a means of strengthening and preserving the inhabitants' health. The analyses carried out by the still very small "Climatological Section" within the chemical investigations office comprised climatic parameters of five measuring stations, dust measurements as well as measurements of solar radiation in order to gain more information especially on the absorption of UV radiation by dust haze. As the work had been interrupted by the war and many materials and measurement devices had been destroyed, the analyses carried out for the general development plan constituted a new beginning. One paragraph within the general development plan was important for Stuttgart's reconstruction and treated climate planning aspects like the influence of urban development on the local climate, the possibilities of fresh air supply as well as routing and local characteristics. After the temporary dissolution of this field of activity between 1949 and 1951, measurements and analyses were continuously refined and increasingly included immission control and noise abatement. The first measurement report - that meets today's requirements - on the ambient air concentration of carbon dioxide carried out at Charlottenplatz square in 1974 was written in 1975 and focused on traffic-related pollution. 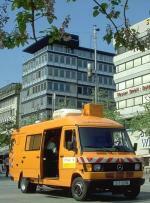 The Section of Urban Climatology had been conducting poly component air measurements at the measuring stations Marienplatz (1977) and Stuttgart-Ost (1979) long before the air monitoring network was taken into operation. After the air measurement vehicle had been procured and equipped, systematic and comprehensive grid measurements were carried out as from 1982. Traffic noise maps covering all roads in Stuttgart were presented in 1983. The Section of Urban Climatology has traditionally published the results of its measurement campaigns in scripts that comprised a total of 9 brochures until the integration into the newly founded Office for Environmental Protection in 1988. Thanks to the new measuring method of infrared thermography, "Data and information on Stuttgart's urban climate" could be collected and published among the "Articles on city development" in 1978 and represented an important consultation basis for the Land utilization plan 1990 drawn up at that time. The revision of the Federal Immission Control Act in 1990 established new administrative conditions: § 47 a committed the municipalities to noise abatement plans; § 40 (2) in combination with the 23rd Federal Immission Control Ordinance presented the possibility of measurements in terms of traffic planning, traffic guidance and traffic restriction. Both developments accelerated the realisation of ambulatory measurement programmes which required the acquisition and equipping of a new air measurement vehicle and a combined noise and climate measurement vehicle. An important change was the integration of benzene measurements into the road measurement programmes. The regulations of the Traffic Noise Ordinance (16th Federal Immission Control Ordinance) and the instructions on air pollution along roads introduced in 1992 (MLuS-92) lead to an intensified development and application of numeric research methods in the field of immission prognoses. It is the same for climatology where the installation and upgrading of an efficient software system has become the main pillar within the Section of Urban Climatology. This can be seen in the development of an interactive CD-ROM entitled "Urban Climate 21" including data, information and calculation possibilities. 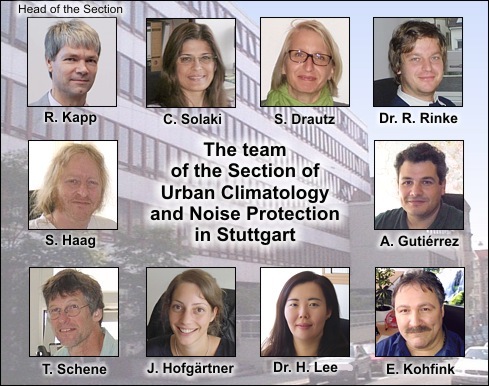 It was published by the Section of Urban Climatology on the occasion of the analyses on climate and air hygiene within the major project Stuttgart 21. The immission prognoses based on mathematical and physical models become especially important in connection with an increased consideration of exhaust gas immissions in the context of development planning - a measure required within the clean air plan for Stuttgart, established by the state in 1990. The integration of Stuttgart's usual measures of combustion bans and of the rules on the restricted use of contaminating fuels into the development planning measures of the clean air plan can be considered as an affirmation of this tradition. However, the emphasis of the technical contribution of the Section of Urban Climatology to the clean air plan was put on consultations in the context of traffic-related measures, characterised by the creation of Stuttgart's driving speed pyramid. This invention was preceded by a spectacular test with a speed limit of 60 km/h on the A-road B 10 in the Neckar valley in 1989. A smaller but yet significant project comprised the measurements and advisory opinions delivered within the exemplary redevelopment project of the former sugar refinery in Bad Cannstatt, where a new commercial area was created in due consideration of environmental concerns - an early example of successful surface recycling. The section has intensified its efforts in the field of public relations through its articles within the scripts of the Office for Environmental Protection, through the input of data from the modernised poly component measuring station Schwabenzentrum with additional information onto two large-scale monitors in the city and of course through the above-mentioned innovative CD-ROM as medium of an urban climate information system (new version 5 now as DVD-ROM). Lectures as a means of public relations played a significant role at the IGA garden show in 1993. On the occasion of the international METTOOLS II symposium of the working committee for environmental meteorology within the German Meteorological Society in Stuttgart-Hohenheim in September 1993, the section organised a much noticed round trip through Stuttgart for the conference members with the focus put on urban climatology. This round trip is still offered to Stuttgart's visitors including an accompanying brochure. 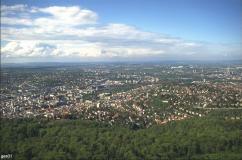 The Section of Urban Climatology has reported on the current air situation in Stuttgart in the form of an annual air balance since 1992. The report also gives an account of the adherence to air hygiene target values, which were determined in 1992 by the city council in connection with the definition of environmental quality targets following the recommendations of the Section of Urban Climatology. 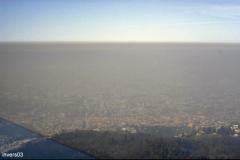 There is no other circumstance that characterises better the development of air hygiene in retrospect than the first and only smog alert (advance warning) in Stuttgart in January 1982. The Smog Ordinance, which had been valid in Stuttgart and which had a traditional structure, was suspended at the beginning of 1997 as the required triggering criteria for a smog alert in times of inversion weather conditions can no longer be met in all probability. Accentuated limit values for air pollutants were determined in 2002 on the basis of an EU framework directive on air quality. The limit values for both particulate matter (PM10) and nitrogen dioxide are exceeded in Stuttgart. And this is why a clean air and action plan is absolutely necessary and was passed by the Regional Administrative Authority in Stuttgart at the end of 2005.